24 January 2019A joint technical committee meeting to discuss in detail the proposed construction of the two Friendship Bridges between Malaysia and Thailand will be held in Kuala Lumpur in March. Malaysian Deputy Prime Minister Datuk Seri Dr Wan Azizah Wan Ismail, who is on a two-day official visit to Thailand, said both countries had agreed to expedite the construction of the bridges linking Kelantan and Narathiwat, namely the Tak Bai-Pengkalan Kubor Bridge and the Sungai Golok-Rantau Panjang Bridge. She said both countries were also committed to making the proposed Friendship Bridges a reality, and to seeing their respective Prime Ministers grace the ground-breaking ceremony for the two bridges by this year. Dr Wan Azizah said the issue concerning the construction of the bridges was raised by Thailand Prime Minister Gen Prayut Chan-o-cha during their meeting at the Government House this afternoon. “I think the design has been sorted out and that they will be going into the technicalities. The joint technical committee will discuss it further on how to go about it. I wasn’t informed about the time frame, just that it’s going to take some time,” she told the Malaysian media here today. Dr Wan Azizah, who is also Women, Family and Community Development Minister, was accompanied by Minister of Agriculture and Agro-based Industry Datuk Salahuddin Ayub, Deputy Minister of Foreign Affairs Datuk Marzuki Yahya and senior Government officials. Also present was Malaysian Ambassador to Thailand Datuk Jojie Samuel. This is her maiden official visit to the kingdom after being appointed as the Deputy Prime Minister on May 21 last year following the Pakatan Harapan victory in the last general election. Meanwhile, Dr Wan Azizah said her meeting with her Thailand counterpart Gen Chatchai Sarikulya today, was also very productive as various issues of mutual interest were discussed. “We both agreed that Malaysia-Thailand bilateral ties have become stronger and solid, and we also exchanged views on how to bring it to greater heights. “I also pointed out to him that Malaysia focuses and views seriously the efforts to improve its ties with Thailand. Visits by the country’s top leaders, as well as new joint-venture projects, are solid evidence of the country’s aspiration. We want to ensure that this era will be the ‘Golden Era of Malaysia-Thailand relations’,” she said. Dr Wan Azizah said both parties were also satisfied with each other’s willingness to open the Malaysia-Thailand entry points in Bukit Kayu Hitam and Sadao around the clock, but only for cargo and heavy vehicles, from April 1. “Both parties also agreed to give it a probational period of three months. It is hoped that the move will smoothen the movement of heavy vehicles between both countries and facilitate our trade relations with Thailand,” she said. 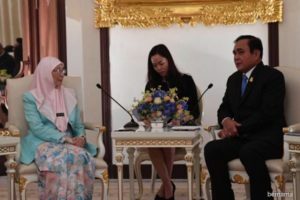 The Deputy Prime Minister said she and Chatchai also discussed issues concerning the southern Thailand peace talks and agreed that the issue must be handled with care and based on laws, while efforts must also be taken to boost the local economy. During the meeting, Dr Wan Azizah also congratulated Thailand for being the chair of ASEAN this year.